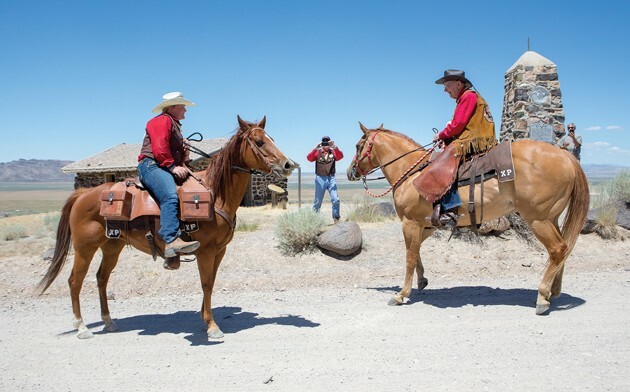 Pony Express riders Savannah Stephens (left) and Joe Hatch (right) meet to pass the mochilla in the annual re-ride from Sacramento, CA to St. Joseph MO on Sunday afternoon at the Simpson Springs Pony Express Station. Stephens made her first ride on Sunday completing 8 miles of the ride. Hatch, who is 87 years old, estimates he has been riding the reenactment for about 20 years. Hatch picked up the mochilla at Simpson Springs, riding a one-mile leg before passing the mailbag to another rider. 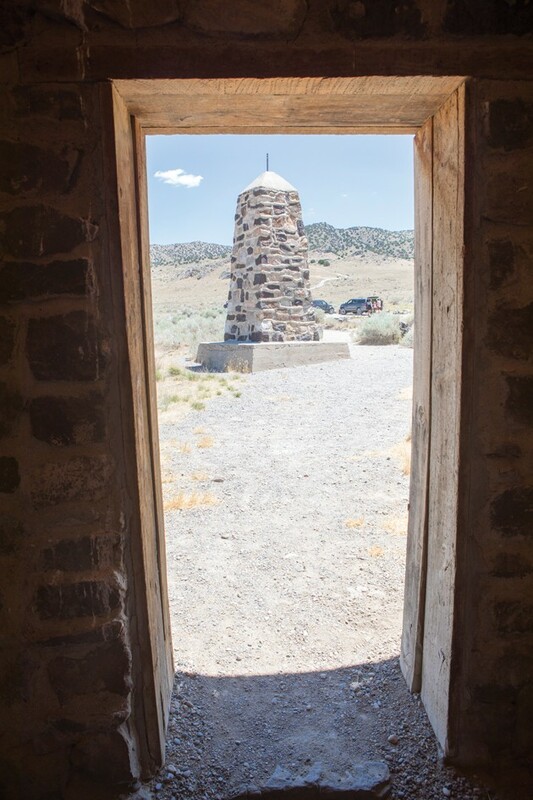 The Pony Express monument at Simpson Springs is seen from the doorway from the Simpson Springs Station built as a replica of the original. Tally Lloyd signs the mochilla after the bag was passed between riders at Simpson Springs on Sunday afternoon. Spectators watch for horse and rider to come into view on the Pony Express Trail near Simpson Springs during the annual re-ride between Sacramento, CA and St. Joseph, MO. The first rider left Sacramento on June 20 and the last is scheduled to arrive in St. Joseph on Saturday. 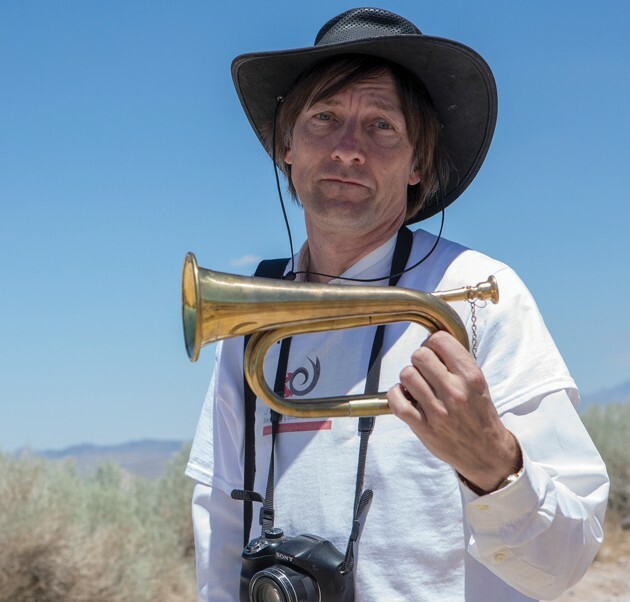 Thierry Lavigne holds a bugle as he waits for the Pony Express rider exchange. From 1860-61, some Pony Express riders used a bugle to signal their approach to a station so their exchange mount would be ready upon their arrival. 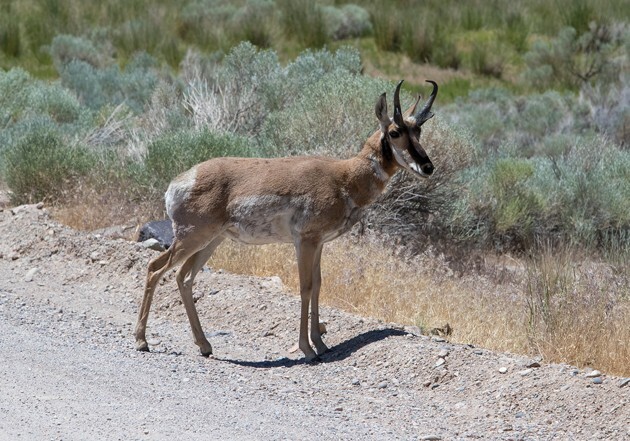 An antelope saunters through Simpson Springs campground. Held every year since 1977, the National Pony Express Association’s annual Re-ride from Sacramento, California to St. Joseph, Missouri rode through Tooele County on Sunday. The entourage of relay riders, dressed in Pony Express regalia, arrived in Ibapah from Nevada early Sunday morning and continued east, passing through Simpson Springs by early afternoon and continuing over Lookout Pass to Faust and on to Camp Floyd in Utah County. The re-ride began Wednesday afternoon in Sacramento and is scheduled to end in St. Joseph on Saturday afternoon. According to NPEA, 600 riders from the associations’s eight divisions are participating in this year’s re-ride that covers the Pony Express Trail’s entire 1,966-mile length. Each will ride relays of 1-5 miles while taking turns carrying a mail-filled mochila. 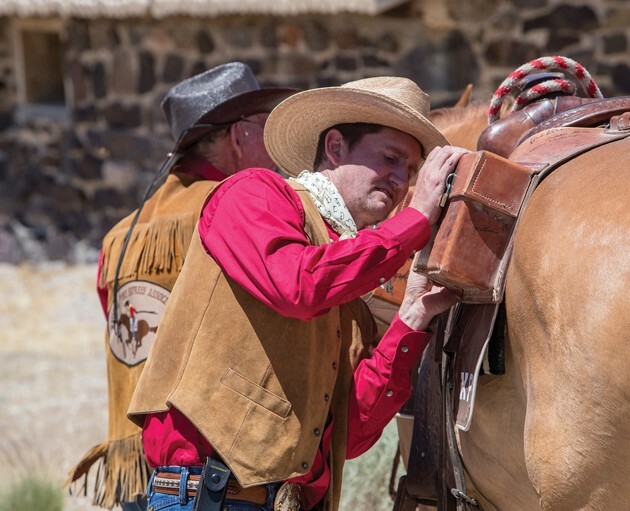 The re-ride is a 10-day, 24-hour-a-day event that celebrates the Pony Express Trail, which existed from 1860-61. It was founded by Russell, Majors and Waddell, a Missouri freighting firm, to carry the mail between Sacramento and St. Joseph. Riders at the time took 10 days to cross the entire route. 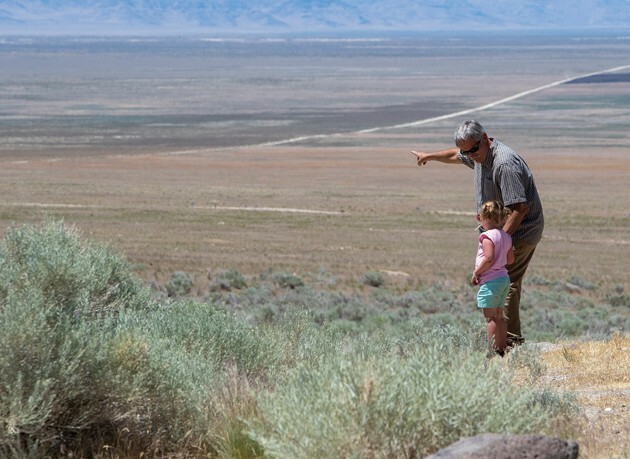 Tooele County’s portion of the trail today is a two-lane gravel road, yet is considered as one of the last remaining vestiges of the original trail. 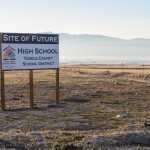 It begins at Five Mile Pass on the Tooele/Utah county border and continues west for more than 130 miles to Ibapah, traveling through some of the county’s most remote landscape. The overall trail passes through Missouri, Kansas, Nebraska, Colorado, Wyoming, Utah, Nevada and California.